Ridgeway, California: A fictional settlement founded by abolitionists in 1853, after the madness of the California gold rush died down. Located near present-day Oakland, California, the town is home to a little less than 500 citizens. In Ridgeway, everybody knows everybody else- which can be a good thing- or a bad thing. The Roses of Ridgeway: The feisty, determined female citizens of the settlement. They are intelligent, loving, and know their own minds- but they are far from perfect. Download this multicultural historical romance tale today. Valerie Ridgeway is the granddaughter of Ridgeway’s founder, and the sole heir to the town’s ownership. A tall, graceful beauty, she’s had a slew of suitors- most every eligible man within fifty miles of town has come courting for her. Despite her loveliness, however, Valerie has developed a reputation for rejecting men with her icy demeanor. Only a select few of the townsfolk know the secret shame that fuels her bitterness. Approaching thirty, she’s given up on the fairy tale of marriage, choosing instead to give her time and effort to the betterment of the race. Noah Rogers, Ridgeway’s sheriff, takes his job very seriously. An intense man by nature, he bears the responsibility of the safety of the townsfolk, with only a single deputy to aid him. He’s eschewed romantic entanglements in order to give his full focus to his very important work- that is, until he lay eyes on Miss Ridgeway. He’s desired her from afar, biding his time, watching as she cut down a string of “suitable men,” one after another. He’s aware of her reputation; still, he senses a vulnerable, radiant creature beneath all the sass and ire, one he intends to discover. Just as Noah begins to woo Valerie, a rash of crime invades the usually peaceful environment of Ridgeway. When the safety of the innocent citizens of town becomes more threatened than ever before, Noah must find a way to protect them, and the woman he loves. 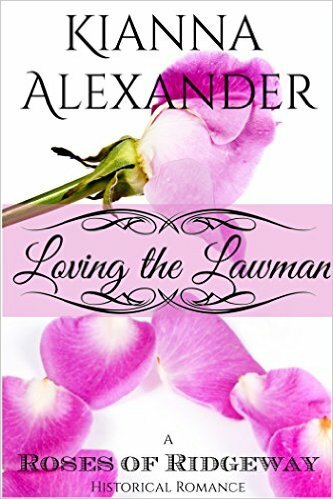 But when shocking violence, loss, and grief threaten to unravel their hard-won courtship, will they find a way to overcome it all, so that Valerie can truly begin loving the lawman?